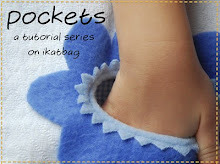 If you've just joined us, I recently re-confessed that I used to obsessively sew bibs. I'm cured now, but not before I cut out 105 bibs (that's 210 pieces of flannel and 210 pieces of velcro). If not for Kate unearthing them a few days ago, they would have remained forever unsewn. I pity them, but not enough to actually sew them up in a hurry. So I offered to give them away to other, kinder people who would sew them up and give them to a real child to use. Since there was some interest, I sorted through the bib pieces, and picked out 24 bibs to give away. What I will do with the rest I don't know, but I sort of still like some of the fabrics, so I might keep them for baby gifts. If I sew them up. If. Ha ha ha ha ha ha ha ha! 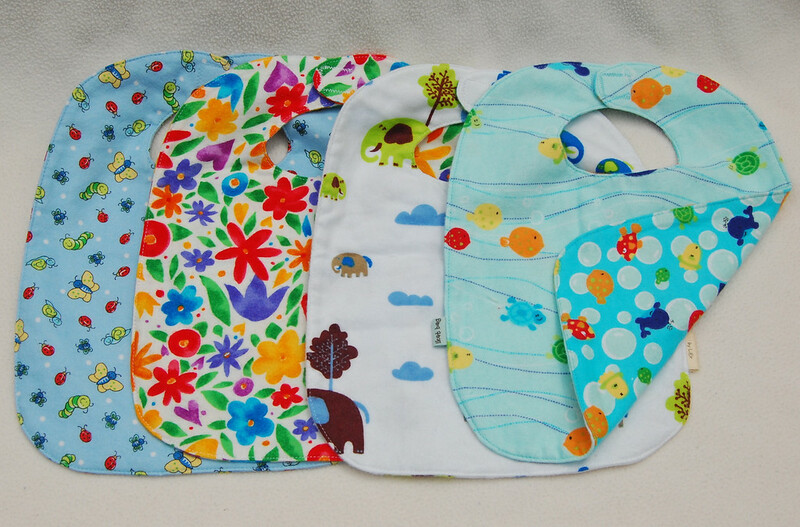 I am giving away 6 lots of 4 bibs each. This means I will pick six (6) commentors at random - 3 for the boy bibs and 3 for the girl bibs and force them to accept my unsewn bibs. whether you'd prefer bibs for a boy or a girl (or no preference). by midnight Wednesday 30 June 2010. I will do the draw early on Thursday and announce the winners then. If you'd left a comment on that earlier post, I apologize but you'll have to enter another comment here on this post, since I will be doing the draw from just the comments on this post. and some of the fabrics for the girl bibs. 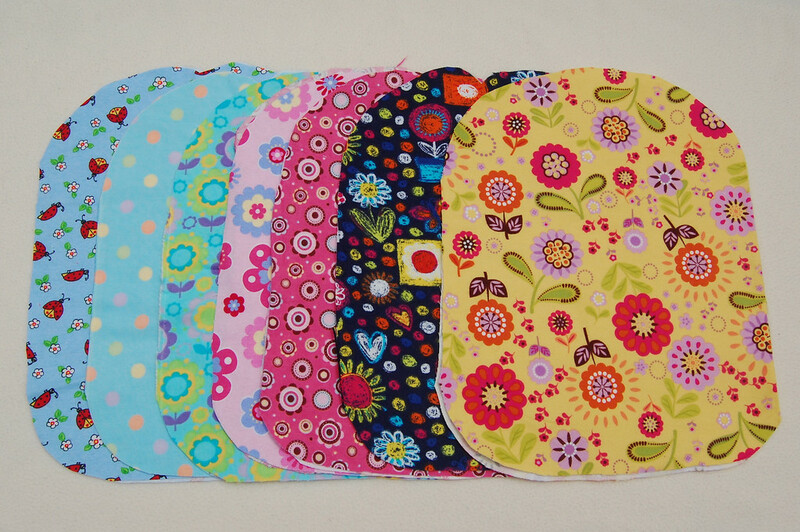 Some of the bibs will have the same fabric on both sides, and some will have different, complementing fabrics. I will not be providing velcro/buttons/safety pins/masking tape/whatever means you might use to fasten bibs around babies' necks. Each pair of fabric pieces that make up a bib will have seam allowances included, and the sewing line marked out in random color pencil on one of those two pieces. To sew up a bib, you place the two pieces together, right sides facing, and sew along the sewing line, leaving a small opening at the bottom of the bib for turning out. Then you snip the curved seam allowances and turn right side out, and top stitch along the edge. And then attach velcro or buttons or whatever. Easy. P.S. I was very, very touched by an offer by one of the previous commentors to send me some fabric in return for the bibs. Thank you, but there is no need to. I am happy to send them to you just because I know you will give them a better future than I ever will. I would LOVE to sew up some bibs. I have a couple of friends that are expecting babies. This is a very generous giveaway! Thanks! Prefer girly, but would be thrilled with either. I would love some bibs! Pregnant with a baby girl now, but I also have a toddler boy who still uses bibs. I liked all the fabrics in your example pictures. Hello, I am having a baby girl next week and would love some bibs to sew!Thank you for your generous offer! I have a million unfinished things around here buy I'd love some bibs. I've been meaning to make some but hate cutting so this would solve that. I prefer boy but girl is good to as my sis-in-law is having a girl soon. I have a niece on the way in a month or two... I would happily finish and re-home a set of girl bibs! You are too sweet to offer your unsewn bibs! I just adopted a baby boy! But I would have no preference since theres always bunches of baby girls around too. I really really need some new bibs for my son and I hate cutting out, so I'd love these. I never win anything so I'd be stoked to win these lol! What a generous giveaway! Thanks! The fabrics are amazing! What a generous gift! I have no preference as I'll be sewing them up for baby shower gifts of which I have both boy and girl showers to attend in the near future. My first bibs ever! :-) I would happily sew some more and could definitely use them for my little boy! And you know what - I love your flannel bibs. The fabrics are SO gorgeous! I do not know if it is me - but it seems to be REALLY hard to get printed flannel in Germany. I have had not luck! It is hard to get flannel at all for some reason and if you find some it is either solid or checked. :-/ I can't believe what cute fabric choices you have!!! I would love to give a home to unsewn bibs, I have several friends that are pregnant at the moment and what a great gift! I would love to sew some bibs, I have a preggo friend who is due end of August but she doesn't know which kind shes having so I'll take a lucky dip please! Thanks a lot! Wow! Thanks! I have a nearly 6 month old little boy who has just started solids and whose big brothers made a terrific mess of all our old bibs!! I was just thinking about making some! So I'd LOVE some boy ones! I would love some bibs! Thanks! I love love love your bibs ! and I have 1 daughter and 3 boys at home, so I use them a lot ! Bibs would be great - either colourway! 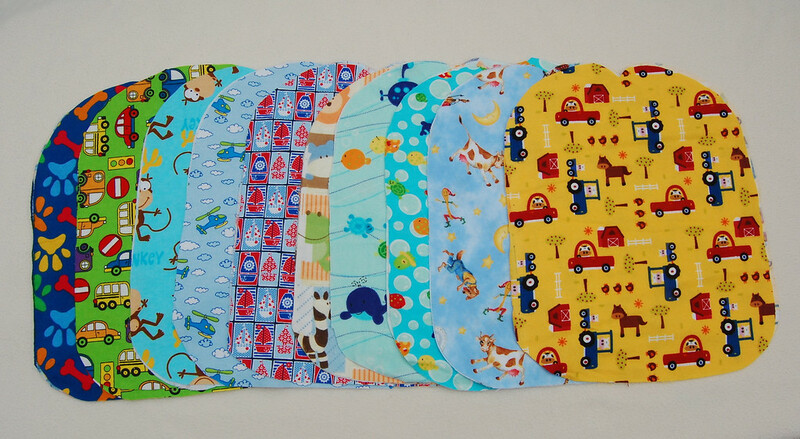 wow 105 bibs *_* sounds like fun :D i'd love to sewn some bibs for a boy. I would put those bibs to good use, well my little one would not me lol. I prefer the boy bibs but either would be nice. I'd love the chance to win some. Either would be fine for me, what great fabrics! I'd love some girly unsewn bibs. I was just thinking I needed to make some more (I love my handmade ones more than any of the storebought ones). Hi, I don't know if I can participate, as I live in France, but just in case, I would like bibs for boy. Any way, thanks for your explanations, it's always a pleasure to read from you. I would LOVE the baby girl bibs. We are getting teeth and the drool is INSAINE! Really cute fabric, love the girl colors, but I'm having a boy in Oct. So I should probably stick with boy colors :) Thanks for the chance to win! Would be able to put these to good use! All the fabrics are adorable. Would be happy with anything. I would love some adorable bibs. I have a very messy little boy. Would love these, my baby Sophia is 4 months old and we will be venturing into eating soon. Would love the girl fabrics. Oooh fun! I would love to sew some new bibs for the new babies in my life!! Boy or girl bibs would be terrific! I would love a girl bib. We've just started solids and teething with my 7 month old. She's just worked out how to spurt food back out if she doesn't like/want it. Adorable! I would love to have some of your beautiful bibs! I am expecting a little boy in a couple of weeks. Thanks so much for a lovely giveaway! What a generous giveaway and what lovely fabrics! I guess I would prefer the boy bibs, just in case... (girls can get away with using and wearing boy stuff, but the opposite is rarely true). I would love to sew some of the boy bibs for the little boy my brother and his wife are having in August. I have one of each so I'm happy to have either set. What a fun giveaway!! Thanks! Hi!! My name is Meg. I don't have any facebook or twitter etc accounts, but I just want you to know that I stumbled upon your blog. You are an AWESOME seamstress!!!! You have inspired me to start sewing with your wonderful patterns. I would love the pattern for these bibs, as I have twins. Keep up the GREAT work, and thanks for the inspiration! Thank you for sharing! I would take either :) I love all the fabrics! I have two little grand sons who would look precious in some of these adorable bibs, and it would be great to have them all cut out and ready to go! Thanks for your generosity in sharing with the winners. Thanks for the chance to win! I'd like the boy bibs! This would be a great way for me to learn to make bibs and as I'm expecting a girl in Aug after 2 boys, some girlie bibs would be perfect. My son can always use some more bibs... and I love sewing them, too!! But I have no preference, since I can sew them as gifts. Thanks!! Oh pick me! ;) I would love to have either Boy or Girl fabric. I have lots of babies around in my life, so either would be great! This is so sweet of you, thanks for this giveaway =)I am pregnant with a baby girl now due at the end of July =) and I 'd love to win it! I would love to sew these! I would much rather sew and cut the fabric! Love your fabrics! I would choose the girl bibs if I could. I have a little baby boy here that could use some more bibs. I would gladly sew them up and use them. I have a new niece. I'd love to win some bibs. While she's a girl, I have a feeling that she'll be a bit of a tomboy, so either boy/girl/mix works. I would love some bibs! The girl bibs would be made and gifted to our bestest of friends who are expecting their first child! Thank you so much for offering such a great giveaway - you are so thoughtful! Boy or girl, bibs of a decent size can ALWAYS be used around here! Oh how I need new bibs! My poor twin girls are wearing old, stained bibs that all their brothers and sisters wore. I just had a friend who had a baby girl and I would love to sew her up some bibs! And I have a cute boy cousin, too, so I would love to have either! Ohh what a neat giveaway! I would prefer the boy bib fabric please! I would love them, and I have no preference. My email is spawnspoet001@hotmail.com ! I would LOVE to sew these up and give them away. I don't care if they're boy/girl. I would love some bibs! your fabrics are gorgeous. Cuteness! I'm expecting a boy in August and would love some boy bibs to sew up. What a lovely giveaway! My sister is about to have a baby boy and I will be making her bibs, among some other things. I love the monkeys especially! She has already bought quite a few monkey sleepers for some reason! What a great treat this would be - I keep meaning to sew some bibs, but it's the cutting part that makes me crazy. I can't believe you cut out 105!!! I would be happy with either boy or girl fabrics (with slight boy preference!) - thanks for sharing! What a gift!! I love them both. No preference. I have 2 girls, but were looking at adding to the brood very soon. So either woud be wondeful! Thank you! I would love to have these as shower gifts, or for any future children that may occur in my own home (although, some days, I wonder if the two we already have are going to drive me sufficiently batty). awesome! we could use some more of those!!! I have a girl in bibs now, but I'd take any fabric combo! I would love to sew some bibs, it's always fun! We love baby girl bibs but would glady accept either! Wow I love your fabric. I know some lucky nieces or nephews that I could send these bibs to. Thanks for the chance to win! Yipppeeee! I bought bibs for my baby BOY and the dryer melted the plastic backs. YUCK. I dread the cutting out, so, have delayed making bibs and crusty clothes are not fun to do on laundry day!! So, thanks for the opportunity for this give-away!!! And i would love to sew the bibs for my little babygirl. Hello! I have a baby girl and I love all your fabrics, so yes I would like to use your bibs!! Thank you!! My baby boy would love (and desperately needs) some bibs! I just had a baby girl and would love to sew some bibs for her! I could sew up some boy bibs. This is a great giveaway. I've got a baby boy, but I've got baby showers coming out the wazoo, so either would work. My niece is expecting a little girl in September and would love these. Would be great to sew some bibs for my darling grand-daughter! What else are grannys for! Ooooh! I would love to sew these up for my little guy or for a niece or nephew! Either boy or girl pattern would be happily used! Nice giveaway. I would have no preference. kathrynsprowl@aol.com. I love to sew and myself, my brothers girlfriend and my neighbour are all expecting. So many babies! Me me pick me... girlie bibs please! I am making baby things for a boy, a girl, and one that will be a surprise when it's born, so any of them would be welcomed!! Hi ...I never try to sew a bib before. I thought this will be a good opportunity for me to give a try. I would love to have fabric for a boy. This will be a gift for my niece who just born yesterday. What a nice giveaway! I have a little boy who has just started eating solid foods and he definitely could use some bibs! Oh, we need as many bibs as we can get!!! Any fabric, thank you! First time commentator, long time reader. 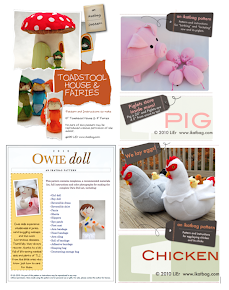 Am so impressed with your creativity and can't wait to buy your toadstool-pattern. I would love to sew up some bibs. I have a one year old girl, so would prefer girly bibs. But boys would be fine too, since there are many babyboys in my life. That IS a lot of bibs! I have no preference- I would love to win any of them! Would love some for the baby boy coming in September! What great fabrics! I would love to sew up some bibs to go with the burp cloths I am making. I have a little boy so I will say boy fabric but I would find homes for either one. Thanks!! I have a daughter (18mos) and a son (3mos) and would love to stitch a bib for either one. However, seems like a lot of other people want bibs, so don't worry about me if you run out! This is a really generous offer, and I would like to send you something just for being so thoughtful. Could you email me at deannanfox@gmail.com? Oh what treasures we find at the ikat blog! Can't wait for the unveiling of the Toad Stool Pattern! Love the pics of your darling sloper dresses. Your girls are precious. I have a Jenna too! or just click through on my name. I would LOVE some bibs. My niece just had a baby boy and I'd love to finish some boy bibs and send them to her, especially since she loved the peepee teepees I sent her! Two of my friends are having boys, so... I'd love a boys set of bibs. Thanks! Sounds like fun! I just had a baby boy 5 days ago and would love to sew up some bibs for him. Or if girl ones are all that's available I'll do them for gifts. I would love to get the bibs. I prefer girl but would take either. Thanks for the great giveaway. Pick me, pick me! Boy bibs please! I have a ten month old boy who is one heavy drooler!